What makes agedashidofu quintessentially Japanese is not just its simple flavours, but the juxtaposition of the textures–crisp outside and slippery smooth inside. Wrap tofu (start with firm tofu, and when you get really good at frying, graduate to silken) in cheesecloth or paper towels and leave to drain for at least 10 mins. Slice into cubes and coat with cornflour/potato starch (plain flour can be heavy) and fry in low to medium heat oil until golden on all sides. Don’t make a batter like some recipes suggest–it makes the tofu heavy and oily. To make sauce, mix dashi or bonito stock, and equal amount of soy sauce and mirin, and bring to the boil. (About 200mL dashi to 25-50mL of soy sauce and mirin). 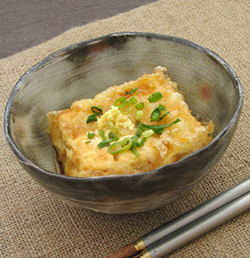 Place fried tofu cubes in a deep dish and cover with the hot sauce. If you want a thick sauce, add a little cornflour dissolved in water to thicken. Garnish with bonito flakes, finely chopped shallots and grated ginger. Serve hot.